It’s 6:30am, and we pull into a Dunkin Donuts. Parking next to a large liveried truck, Hobie Call is sitting in the passenger seat, and we stop for a chat. Heading in, race crew in branded shirts were fueling their bodies up for the day. More familiar faces. Laura messner. Coach Payne DeWayne. Everyone is laughing and joking and spirits are good, despite the miserable rain. 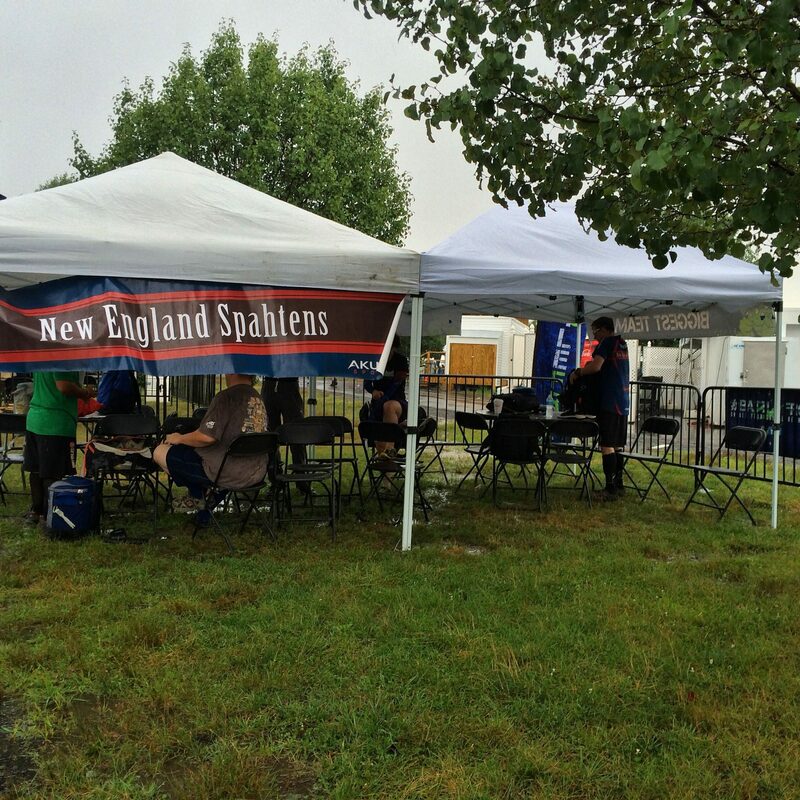 We grab our own fuel, set the gps to Raceway Park, Englishtown, New Jersey – and the New England Spahtens were heading to our first BattleFrog. 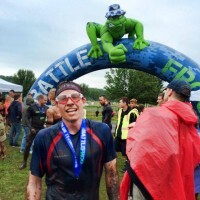 Battlefrog is a new OCR series, but on the surface you wouldn’t know that. The tri-state race was only their fourth race, and not as many months. It’s safe to say that they’ve disrupted the industry in that short time – landing three very well regard events, and having a slick social media campaign to go with it. 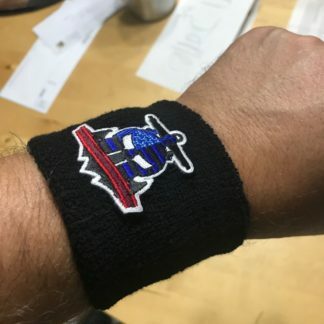 Leading up to the tri-state event, it was almost comical, border line annoying, as discount codes from every name and character in OCR flew through my FB feed – and in discussions with their team, it was clear that they were trying to build something, and build it big – and the budget and backing was there to do it. The 800lb “frog” in the room… New England is no stranger to challenging, longer distance Navy Seal inspired events. Western MA has seen two renditions of the very well regarded – and highly loved – BoneFrog. 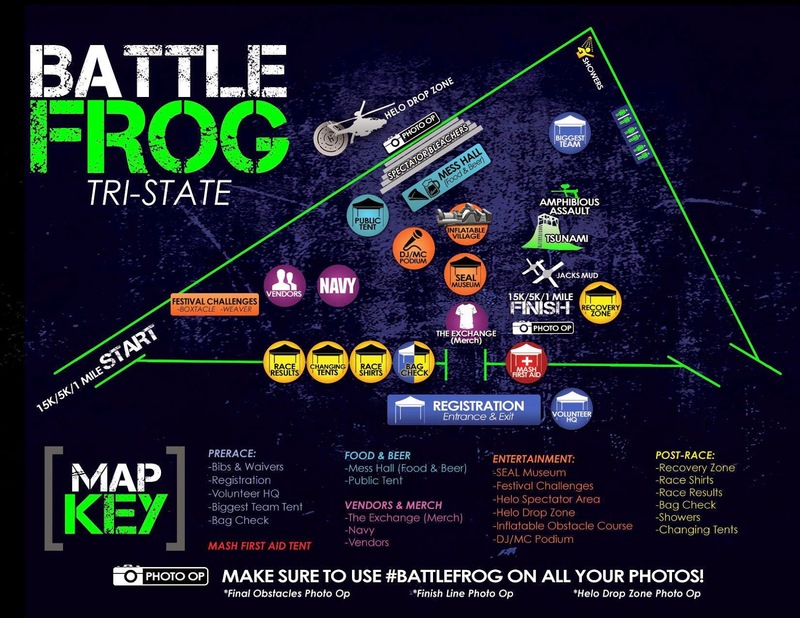 Lets make sure everything is clear – BoneFrog and BattleFrog are two different events, with different ownership and different directions. 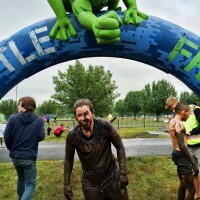 We love BoneFrog, and will support the local guy (#racelocal) – especially one with an event of the high quality and standards the BoneFrog team put on. Based on that, there was a certain amount of trepidation when BattleFrog hit the scene – with similarities in name, distance and obstacle difficulty, there was (and is) a lot of confusion in the ranks and masses of the weekend warrior. This will always be a problem for both events, I feel. One thing is clear though – BattleFrog are well funded and well backed. Not just more so than BoneFrog, but potentially more so than any other OCR in the market today. They have also made very smart hiring moves, and many of the individuals who currently work full time for BattleFrog have experience from other OCRs, or OCR communities. They have the advantage of building off the mistakes others had to make, and avoiding doing it themselves – and they’ve hired the people who were there the first time. The end experience is an event that is slick, has high production values and is able to do the right thing the first time. 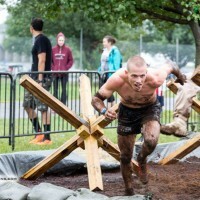 The NJ venue was the well known Raceway Park – home of the past three Worlds Toughest Mudders. This meant it was super easy to find on the GPS, tons of local signage to find your way to the parking lot once you got there. Plenty of parking ($10 per car) that was a short walk to the main entrance to the festival. We were there early (three of the #neseliteteam were there for the elite wave at 8am), and the registration for the Opens was smooth. No waivers – just flash my ID and get handed a packet with a bib, pins etc. The Elites were a little slower – and I heard rumblings that the elite checking lines were frustratingly long and slow when it got closer to the 8am launch time (they ask everyone – even elites – to leave an hour to checkin, that would have solved this problem). We took a short walk of the venue, watching tents go up, before finding the team tent. Rather than the promised 40*40 with tables and chairs, we had two 10*10’s side by side – minor I know – but I much prefer when an event under-promises and over-delivers, not the other way around. Elite competition is a tough nut to crack. At BattleFrog, every elite member is given a wrist band – the only way to win money is to finish every obstacle and keep your wristband. 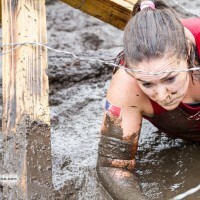 There are no penalties on course for elites, no helping each other either – just mandatory completion of every obstacle – or you surrender your wrist band and are effectively DQd from the prize money (you can still complete the race, log a time and get a medal). Top three men and women get healthy prizes, podium photos, trips in a helicopter – and most importantly their prize money is paid out promptly. 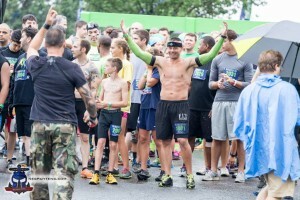 Hobie has become a consultant, if not employee for BattleFrog and in previous events he had ran rabbit, not eligible for the prizes – but for NJ, he was lined up head to head with Pak – for the first time in many many races there would be a show down. Without too much fan fair – Hobie was easily the fastest guy through the course. Pak made a mistake on course and was lost in the woods – ultimately resulting in a DQ from prizes. 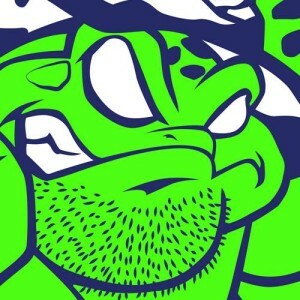 Clearly upset with the situation, he later ran an incredibly competitive time (untimed) just to prove to himself he could do it, and wrote a complimentary post to the BattleFrog staff via social media – classy move. Both of these guys are amazing athletes – and while I personally don’t get “into” the elite scene, it was pretty awe inspiring watching them peel off from the front of the elite pack by the first corner! Back at the team tent, I was hanging out with people as they trickled in. I was unable (and annoyed) to run the course due to an ankle injury, so I played team photographer where possible, and made my way to the finish complex to catch the elites coming in – I caught Hobie and a few others – along with Jeff, Nele and Corrine from the #NESEliteTeam as they hit the Tsunami (NOTE: Jeff supplied a course breakdown, included below, as I could not). Of course, regardless of how much money is thrown at something – the proof of how professional and mature an event is gets shown when things go wrong. BattleFrog had a couple of logistical things that showed they weren’t quite the well oiled machines the big boys are – the lines for elites at registration being one – pressure issues at the hose off station through the day – compounded by an incredibly muddy finish for all (including the kids race). More than one parent was mad that they couldn’t hose off their kids before leaving. While water trucks came in, and at one point they had a high pressure hose on the racers (shut down fast due to the proximity of the food trucks! ), this was never really solved. Changing tents were oddly placed on the opposite side of the grounds – but all in all, these are minor logistical things that shouldn’t be very hard to fix at future venues. Most importantly, the course flowed well – some minor backlogs reported, and almost every race could do with more signage to prevent mishaps like the high profile detour Pak took. BattleFrog look after people. As biggest team, we received a tent – something that is mostly a standard – but was extremely welcome this time due to the rain in the early AM – and uniquely a “keg”. Depending on the venue, this is a keg of beer for the team, or a big pile of beer tickets. It was fun, being “Beer Santa” all day and getting to hand out tickets to the team and our friends (and the occasional passing stranger) – many of us had long long drives home, so we weren’t drinking a lot individually. I think it’s safe to say that during the day almost every employee of BattleFrog HQ stopped by to meet us, and say hi. 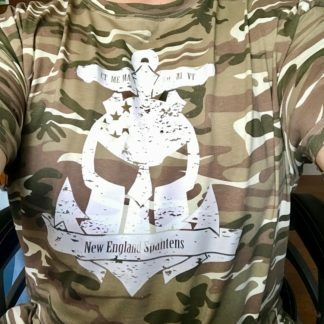 New England is clearly an important region for them in 2015, and they smartly wanted to ensure we were having a good time, had our feedback listened too, and felt special. Mission firmly accomplished. Icing on the cake? I was offered a ride in the helicopter – something they reserve for the elite winners, media and influencers. Seeing as I didn’t run, I passed my seat onto Corrine, and in a very kind gesture, Hobie offered his winning seat up to one of our team – very classy move, and Nele was thrilled. At the last minute, they found me a seat – and we all got to go together. 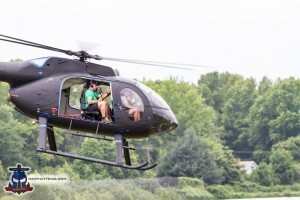 A freaking helicopter ride, at an OCR. 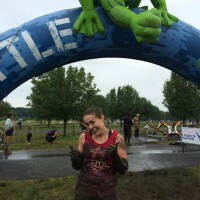 Would I run a BattleFrog again? Absolutely. I would strongly recommend you do too. The OCR industry is changing, and new companies are coming. BattleFrog are very different from the local OCRs we see pop up all the time (who have differing levels of success), and if they manage to make returns on the investments they are making now – they’ll be right up there at the top before too long. All I know is that when (if) they do hit the magic numbers that keep them in business doing what they do – I’ll be able to say I was there in the beginning – and we all got to watch them grow, together. 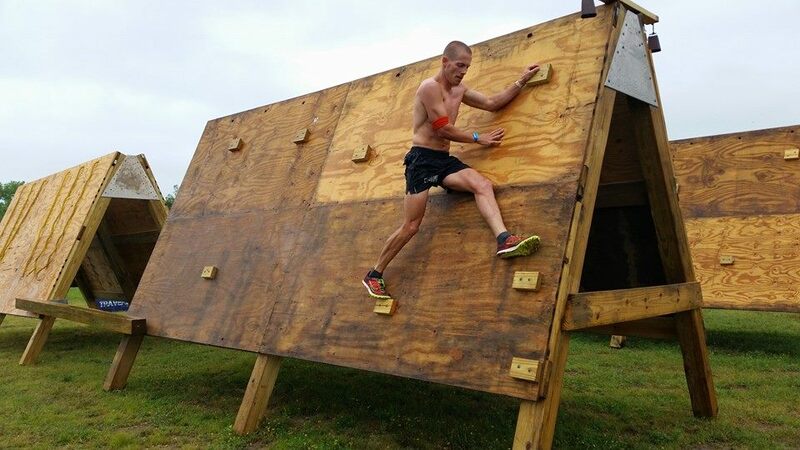 Jeff Wohlen, #NESEliteTeam member came 31st overall in the elite wave (5th in his age group), and provided the below coverage of the course and it’s obstacle break down – something I didn’t get to see. Thanks Jeff! The 5k had some serious competition. Robb too. The race started out with a short run on pavement to the over-under-through section. From there the course went to a dirt bike track. Since it was raining at the time, the track was a muddy, sloppy mess and it was very difficult to keep your footing. After running around the track for a bit we came to the Jerry can carry. The cans were filled with water and weighed 40-50 pounds. We had to carry the cans around more of the track including up some very slick, muddy hills. These small hills caused trouble for many racers, especially those without good footwear. Upon completing the Jerry can loop, we had to climb a very large A-frame ladder wall where the rungs were quite far apart. 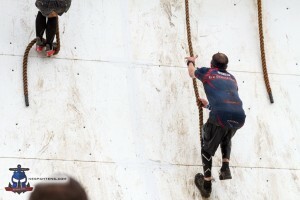 The obstacle was made harder by the fact that it was covered in rain and mud. After a little more running on the track, we climbed a 12 foot ladder wall and entered the paved race track portion of the course. We were a little more than a mile into the course at this point. The next obstacle were the monkey bars. They bars were sloped downwards over a pool of water. Each bar would also spin. The spinning bars along and the downward slope when combined with the rain made this a very challenging obstacle. Originally the elite wave was going to be forced to go up the slope instead of down but the rain made the bars so slippery they estimated there would be a 90% failure rate. After running though a large field of tires and over a large A-frame cargo net it was back into the mud for a tube crawl. These were about 12-15 foot long tubes that were about 3ft in diameter. 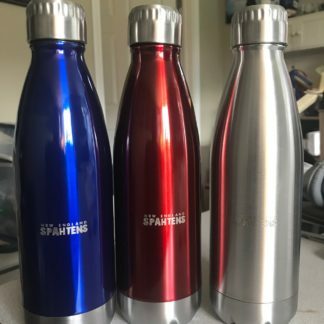 Unlike other races though, these were about half filled with water. This made for a very claustrophobic experience. Once we were out of the tubes we had to do 20 “body builders” in the mud. At this point the course split and the 15k racers were sent off onto another dirt bike track filled with 8ft walls, angled tubes to climb through, a Tarzan swing, and more mud! Upon exiting this dirt bike track, the course went off into the woods for some trail running. Not long after the trail started there was a rope climb, a log wall, and a small crawl under a net. Then we went onto a “river crossing” which was actually a slog down a river that had a sandy clay at the bottom. Each step through huge river killed the energy from your legs because you had to dislodge your foot from the sludge at the bottom. To get out of the river, we had to climb up a little waterfall but it was incredibly slick and I had to grab a handful of roots to get out. At this point we hit one of the most brutal collection of obstacles I’ve ever seen. It started out with back to back 12ft walls that required a rope to get over. From there it was onto an inverse wall that was about 8ft tall and then a rope traverse over water. There were about 6 ropes that were about 75-100 feet long and were nice and thick so they didn’t bounce all over the place. There was a bit of a backup here (maybe 2-3 people deep) even in the elite wave. I assume this backup only got worse as the day went on. We then had a series of 6ft walls, a balance beam, and a climb over a hay bale and a log. At this point your upper body is shot so the 6ft walls seemed a lot more difficult than they normally would be. We then went back into the woods for a tactical ladder climb. A tactical ladder is only wide enough to get one foot on a rung at a time. When your arms and shoulders are shot, this can be a difficult climb. At this point we exited the woods for good and got back out into an open gravel/parking lot area. There was a giant sloped metal structure to run up and over and then we got to a cargo net traverse, balance beam, and a giant mound of dirt with a horizontal log to climb over at the top. We then ran over to a pond, had to do a 200ft swim across, ran across the opposite bank of the pond then had to swim back across. When going back across we were forced to use the guide ropes which made the process a lot slower and more awkward than if we could just swim. Upon climbing out of the pond for a second time we had to do the “bangers and mash” obstacle which was a horizontal traverse wall using only ropes, balance beam, and a second traverse wall using blocks. The problem here was that they only put 3 foot holds on the wall so it required a lot of finger/upper body strength to swing from hand hold to hand hold. Overall this was a very creative and incredible take on an obstacle we’ve all seen a hundred times. After a short run we had to pick up a 50 pound sand bag and carry it about 100 yards down a line of trees, then turn around and carry it back. 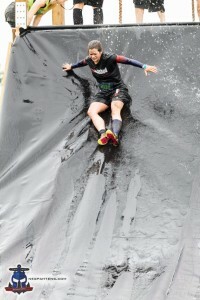 Followed by a sloped wall climb and a slide down some pipes into muddy water. At this point we were back to the festival area and had to go to the paintball shooting range. We had 3 shots to hit a target or we had to do more body builders. I managed to hit the target on my 3rd shot and then it was off to the final obstacle, the Tsunami. This was a giant curved wall with a few ropes at the top. We had to run up the curved wall as high as possible, grab a rope, and pull ourselves over the top of the wall. This turned out to be a very challenging obstacle and left many people running up the wall only to slide back down and have to try again. By the end of the day there was quite a buildup of people taking turns trying to get up the wall. The reward for getting to the top was a super speedy water slide down into a pool. Now that we were nice and clean after splashing into a pool, we had to finish with a mud crawl under non-barbed wire and around Normandy walls. This left everyone who finished absolutely caked with mud and created some pretty epic finish line photos.